Home > Blog > Life > Why Can’t American Girl Dolls Have Disabilities, Too? Why Can’t American Girl Dolls Have Disabilities, Too? I recently stopped into American Girl Place in Chicago. My American Girl dolls are a popular, experiential concept where you choose a doll and then customize her through the purchase of clothes and other accessories that reflect hobbies like cheerleading and taking tea. Absent from the shelves, however, is much in the way of a disabled doll theme. 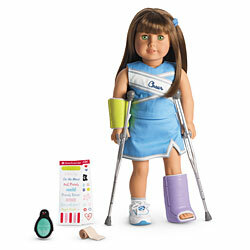 American Girl, which was acquired by Mattel in 1998, says it wants you to “create a doll as unique as you are,” but doesn’t offer many accessories that fully represent the 54 million Americans with disabilities and two million children with special needs. 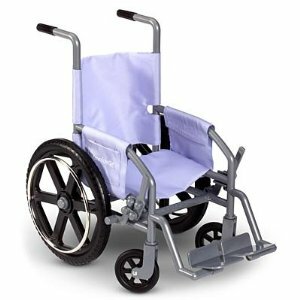 You can purchase a wheelchair accessory ($34), but it looks like one that belongs in a hospital waiting room for injured people — not like the ones used by real kids with disabilities. You can also purchase crutches for temporary injuries, and funky-colored eyeglasses. If a wheelchair is supposed to represent all of disability at American Girl Place, why does the company offer so much variety in other areas? The sheer volume of My American Girl dolls and accessories at their retail stores would make any girl swoon: 40 different combinations of eye color, hair color and style, and skin tone. Two floors filled with racks of dresses, shoes, books and accessory sets for hobbies like eating fondue, taking a bubble bath, going camping, playing basketball, riding a dog sled, and celebrating the Sabbath. For children with disabilities, the pickings are much slimmer. Kids with disabilities come from all walks of life. They use wheelchairs, yes, but they also wear hearing aids, eyeglasses and arm braces. Sometimes their pet dog ($20) is their service dog. Sometimes they have diabetes and need insulin shots a few times a day. Sometimes they go through life with a catheter. At American Girl, a doll version of themselves simply does not exist. While I was in the store, I approached a mother pushing her daughter in a wheelchair. Dana Morel, 23, was born with toxoplasmosis, a disease that made her blind and unable to move and speak. She is a former American Girl customer, but never had the option to buy a doll with items like a power wheelchair, head stick, adaptive switches, or the audio version of an American Girl book. “I would buy these things for her, and she would have wanted them,” says her mother, Janet Morel, who lives in Scottsdale, Ariz.
Changing this scenario would not be difficult for American Girl, which reaped $463 million in 2009 sales. The company does not accept product ideas from parents and kids, but they should, as this would help diversify and grow their product lines. They could then add a bigger selection of accessories to their shelves like hearing aids, eyeglasses, silk scarves for kids with cancer, walking canes, braille and audio books, and insulin devices. America thrives off the diversity of its peoples, but the disabled demographic is being ignored by too many consumer-goods makers. For American Girl, expanding the breadth of their accessories and content to better reflect their customers with disabilities would go a long way. Sales would climb, and young and tween-age girls with disabilities will get a dose of reinforcement that they’re perfect just the way they are. I have a mental illness but I often think what it would be like for someone with a disablement of body. I agree not enough is done for those consumers who require a little more diversity. It’s not just disabled people who would enjoy it. It teaches kids that people are just people whether they are blind, deaf have one leg or anything. More needs to be done and yes I agree there would be an awful lot of sales for this niche. Pity i don’t have any money. If only manufacutrers and designers would come up with something like this. It would sell to an awfully big demographic. What a great article. I know my daugter has one and I am sure other girls with disabilities would like to feel like all the other girls with the most expensive doll ever created! Seems like waiting for the company to catch on might be futile. Instead, turn to the DIY/crafters universe. There are a lot of crafters on Etsy and other sites selling their own (unofficial) American Girl clothing, furniture, bedding, etc. Might even be someone there right now selling disability-related items, but if not, many sellers there take requests. My 6 year old daughter has recently developed a vision disability. She is a HUGE American Girl fan. She is asking for glasses for all her dolls this year for Christmas. She does not wear glasses. I would love for to find a white cane and braille doll items for my daughter. This is a great post I found via google. THANK you. Thank you Penny. I will forward your comments to American Girl. So who DOES offer dolls with disabilities? they do offer wheelcheers glases arm braces and all that other stuff.I am11 and im chubby but I dont see a chubby doll. SO I GUESS EVERYONE LOSES……..
My twinn does, they will even make a doll without pieces, they offer hearing aids.They will make a doll that look like your kid. Thank you Dnt, that is great to hear! I will look into this and maybe I could do a story on My Twinn. My best friend has type one diabetes (I prob spelled that wrong) and she love American girl dolls but yet they don’t hav an omni pod! It’s acctualy common and lots of little girl hav it but they still don’t make one which is tots unfair….. Well american girl should consider making that and lots of other things!!!! I have seen one website that offers accessories such as leg brace, wheelchairs, etc. however I just received the AG catalog and the are somewhat expanding their horizons, so to say they are bringing in a few more things for disabled children. They now have hearing aids and service dogs, but that’s about it. Oh well. This is the address of the disabled dolls/ accessories.